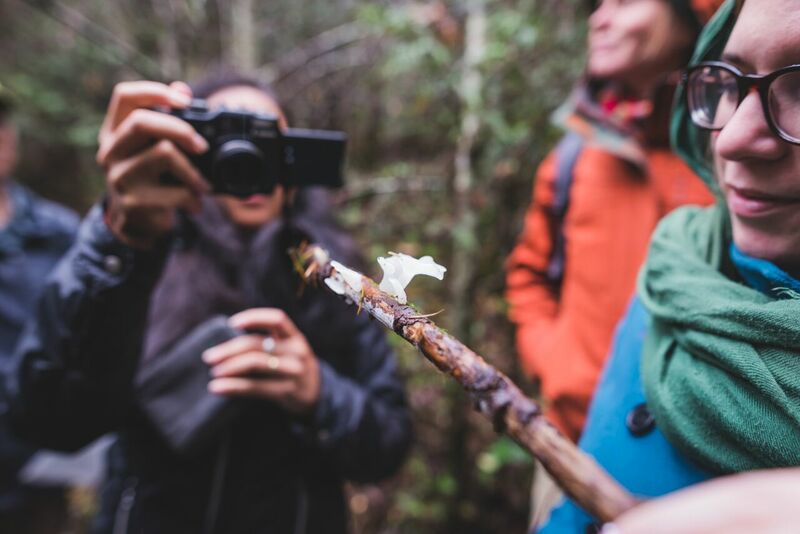 Twenty-four hours, four Metchosin properties, ten experts, eighty guests, uncountable drops of rain, and 165 species of fungi. 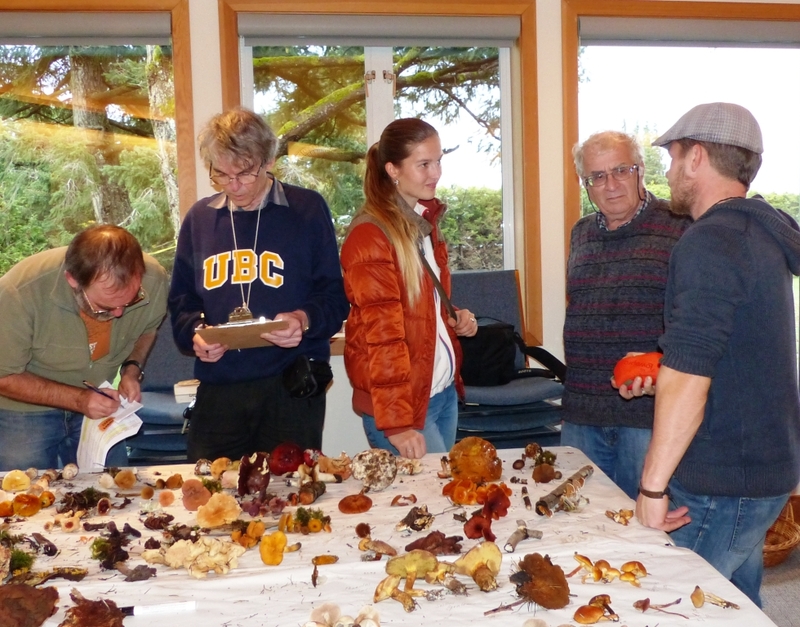 Such was the math at the Metchosin's third MycoBlitz on November 6 and 7, 2015. Numbers, though, tell only part of story. 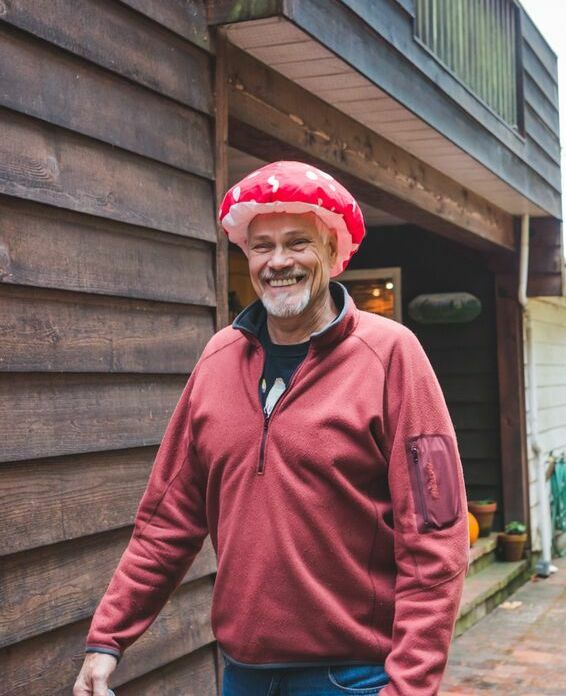 For many of the experts and guests, the 2015 MycoBlitz was a time to celebrate the raw fungal energy of places such as Metchosin, to appreciate the smells and colours of the mushroom caps that emerge in our autumn woods, and to hobnob with others who share the same fascinations. 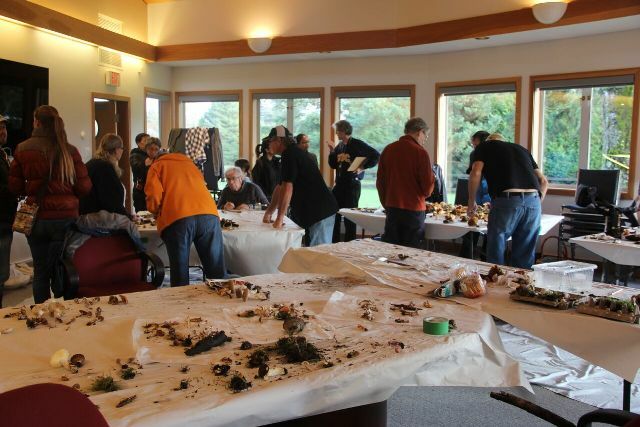 The MycoBlitz kicked off on Friday night at the Metchosin District Council Chambers. A large crowd gathered for the 80th Metchosin Talk and Walk lecture. 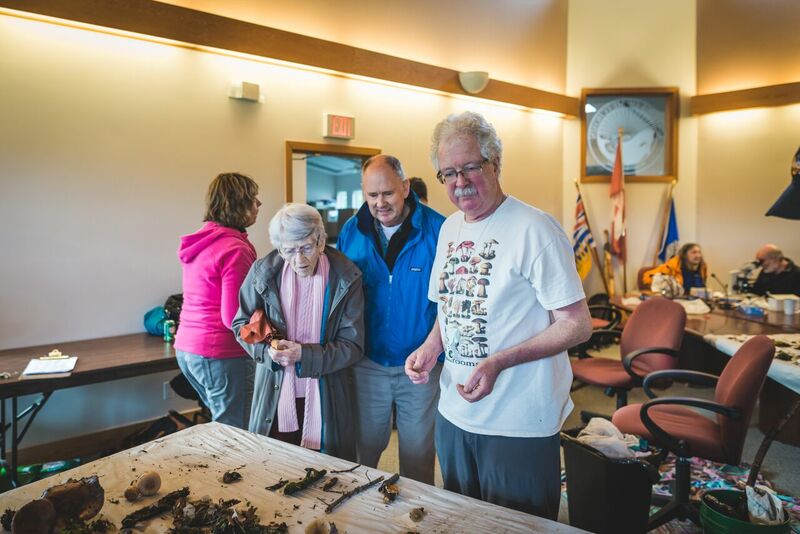 Adolf and Oluna Ceska, a couple at the centre of fungal research in British Columbia, presented the results of their decade-long continuous monitoring of the mushrooms on Saanich's Observatory Hill. 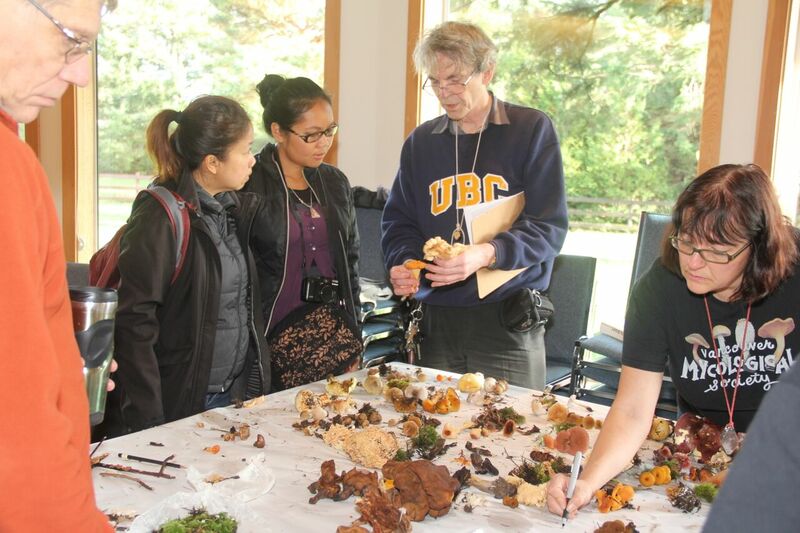 The Ceskas, recently honoured by a mushroom name (Cortinarius ceskae) and a scholarship endowment in their names at the University of British Columbia, showed charts and pictures of their work. They have found more than 1300 different species on the Hill. 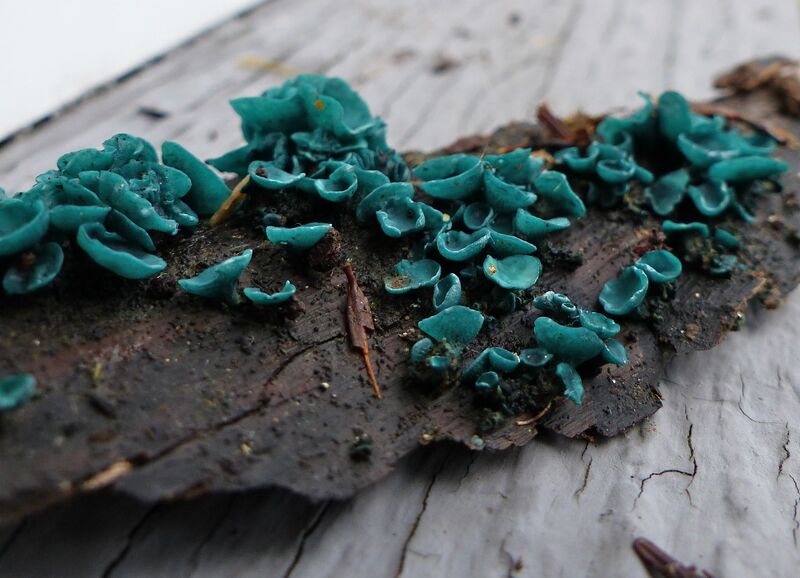 Their research is one of the world's longest continuous studies of a single fungi site. 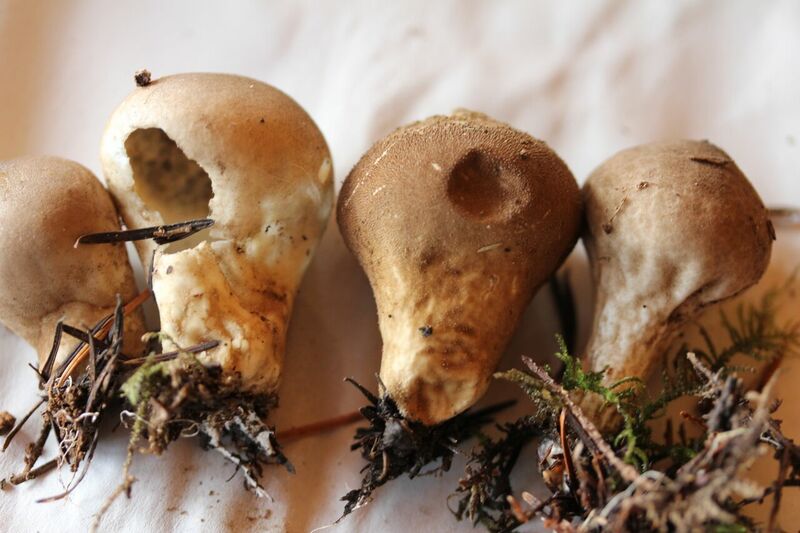 Tubaria punicea, the Christmas Naucoria, a mushroom that the Ceskas have helped to make famous. Picture by Luke Mikler. 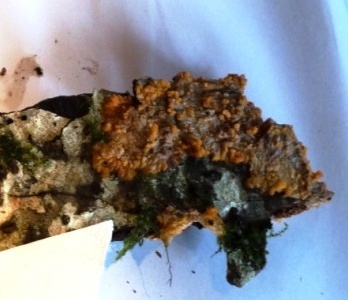 Kevin Trim found this Tubaria during the 2015 MycoBlitz foray to Blinkhorn Nature Park. 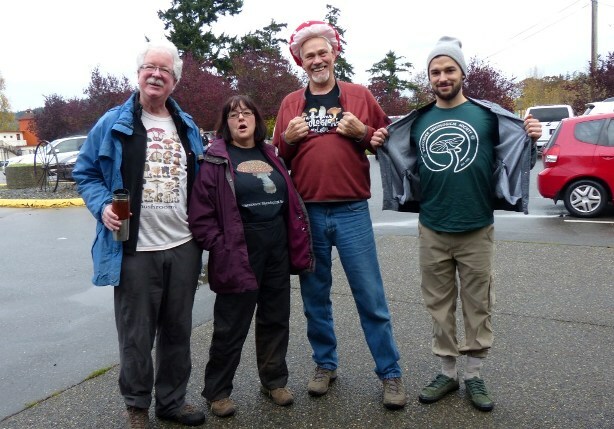 Four of the MycoBlitz experts, (left to right) Andy MacKinnon, Leanne Gallon, Daryl Thompson, and Luke Mikler, show off their mushroom clothes and accessories to the gathered crowd of 2015 MycoBlitz searchers. Picture by Barb Sawatsky. 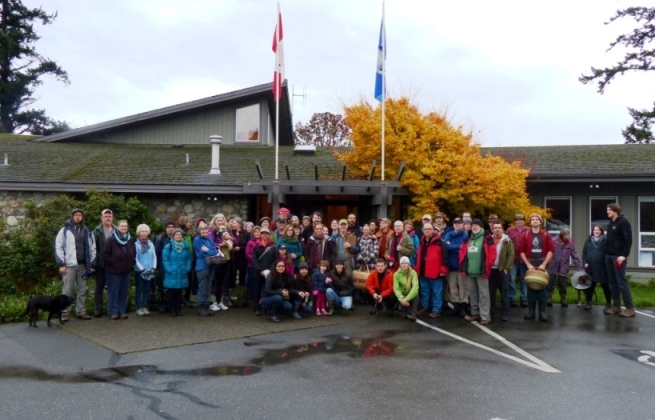 At 9:00 am the next day, experts and guests met under cloudy skies at the parking lot of the Metchosin Municipal Hall. Leaders organized the crowd into four groups. 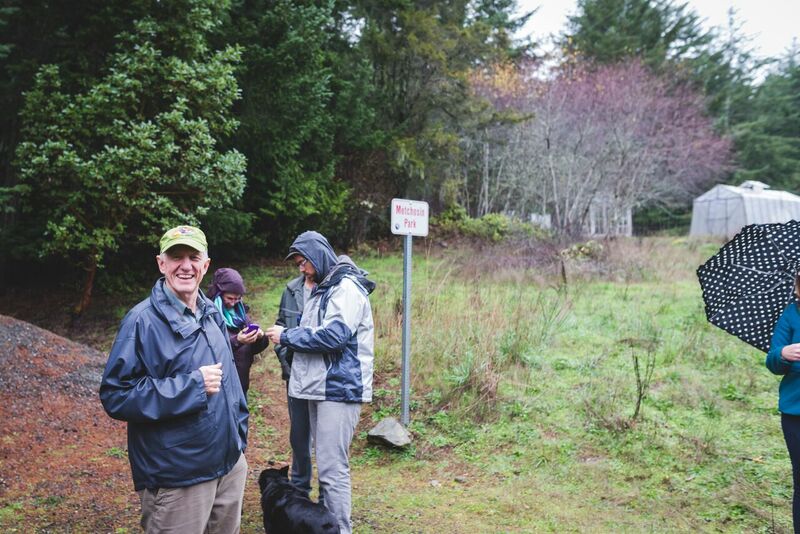 After signing in group members, searchers headed out to Blinkhorn Nature Park, Section 28, Section 25 (Metchosin Wilderness Park), and Camosun College's Van der Meer Reserve. As they left the Hall, rain began to pelt the pavement. Over the next three hours, everyone would get a little wet. Once at their search sites, the four groups encountered a surprising array of mushrooms. 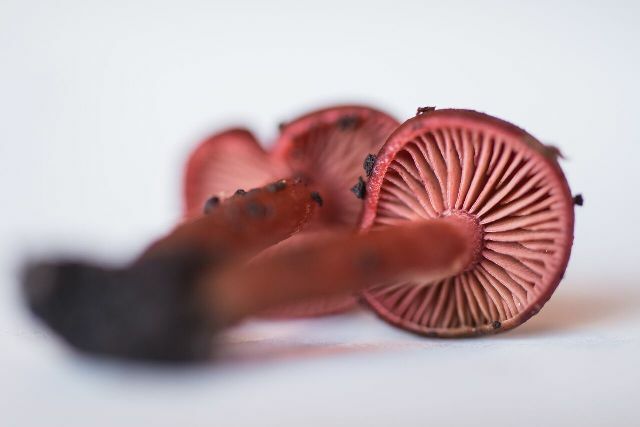 While this has been a good year for mushrooms in BC as a whole, even over most of Vancouver Island, the southern end of the Island where Metchosin lies has not seen the usual abundance of fungi. Get enough eager searchers together, however, and even the hidden will reveal itself. 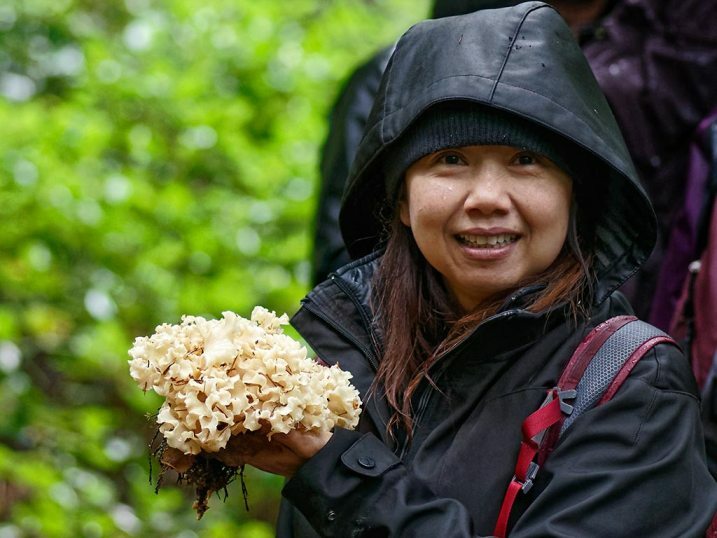 One of the new mushroom hunters found her first Cauliflower mushroom (Sparassis crispa) on the foray to Metchosin Wilderness Park. The smile says it all. Photo by Richard Mably. 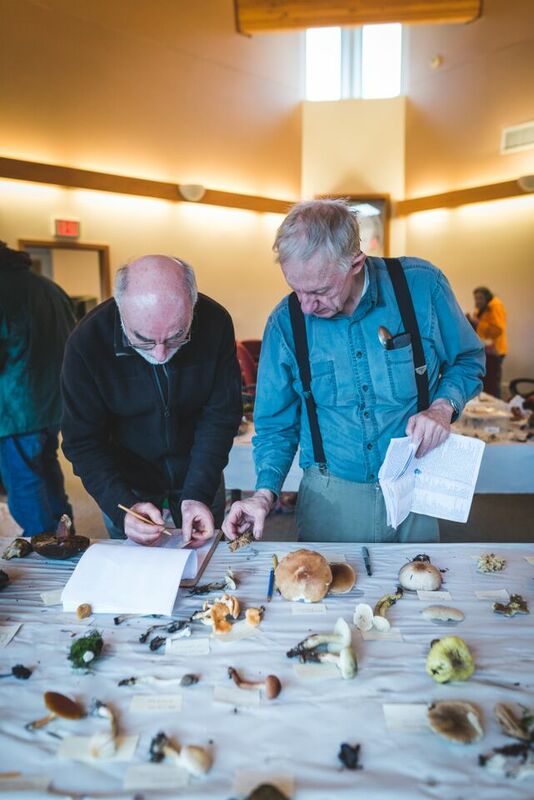 Experts at the 2015 Metchosin MycoBlitz begin to sort the mushrooms and assign names to them. Photo by Brian Domney. The search groups returned to the District Office grounds at noon. They brought their mushrooms into the Council Chambers, where tables had been set up to sort the mushrooms and dropcloths laid to protect the carpet. 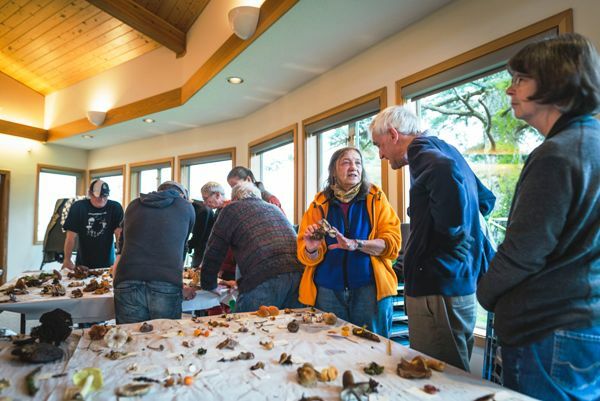 While the experts began to arrange and label the fungal finds, searchers went to Metchosin Community House where the Metchosin Biodiversity Project had arranged a bring-your-lunch film festival (popcorn and drinks provided). Attendees watched the film "Know Your Mushrooms" which combines material from the famous Telluride Mushroom Fest with animation and archival footage (and a neo-psychedelic soundtrack by The Flaming Lips). They then viewed the "Andy and Kem Fabulous Fungal Film Fest," a collection of mushroom clips from the Internet. 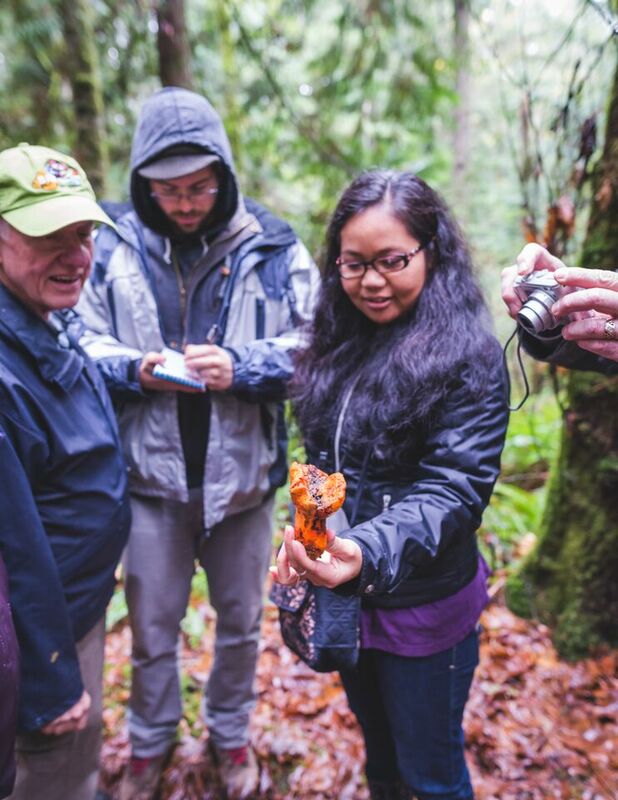 At 2:00 pm, the 2015 MycoBlitz guests made their way back up the hill to the Metchosin District Office to see what the experts had done with their mushrooms. The researchers had worked hard over the two hours of the film festival, grabbing lunch on the fly (delicious food organized by Mairi MacKinnon, with soups by Mairi and Eileen O'Donnell, buns donated by Cobbs, bread by Kem Luther, and sweet baked goods by Royal Bay Bakery). 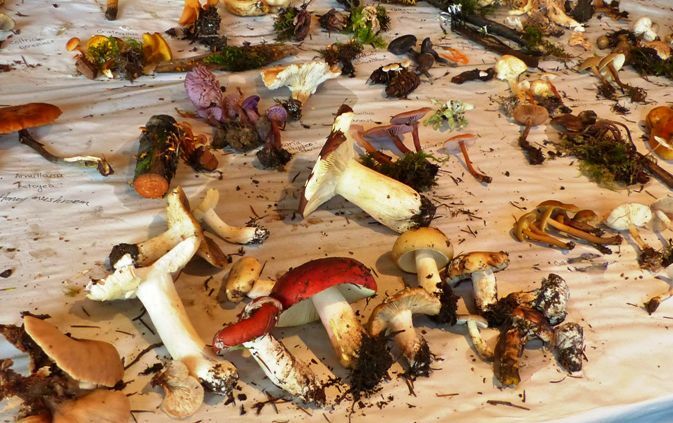 Guests found hundreds of mushrooms laid out on the four double tables. Crowds pressed around the tables to touch and smell the shrooms they had helped to collect and to talk with the experts about what they were looking at. Oluna Ceska talks mushrooms with guests Gerry and Wendy Ansell. 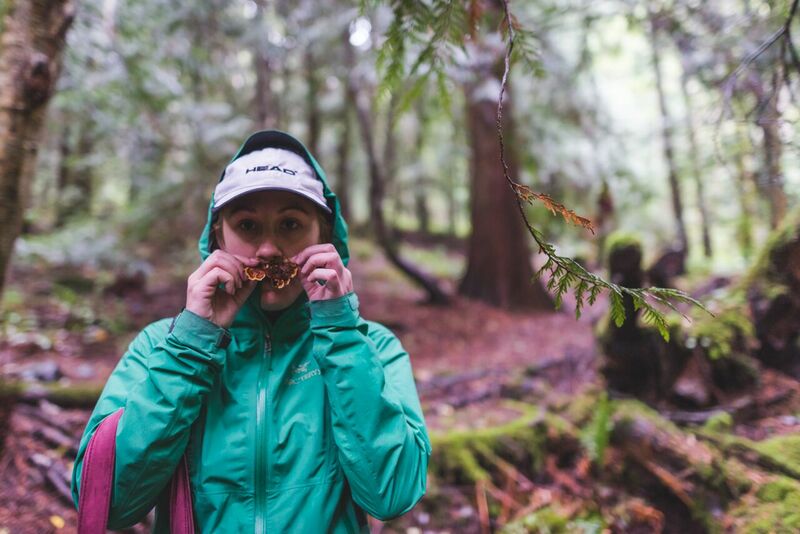 Picture by Luke Mikler. A table of sorted and arranged mushrooms. This collection came from Blinkhorn Nature Park. Picture by Moralea Milne. 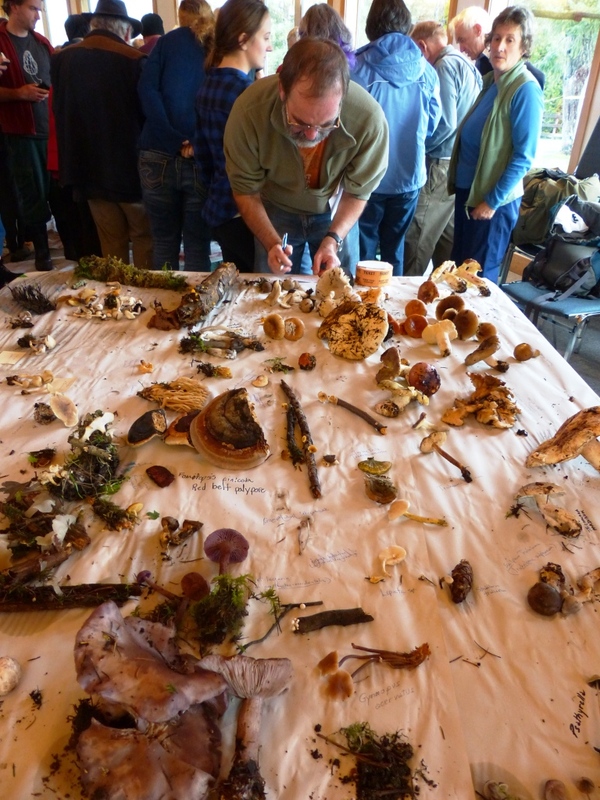 The four table complexes represented the four locations at which mushrooms were collected. Visitors were surprised by the lack of duplication between the tables. The 280 labelled specimens on the four tables comprised 165 different species. 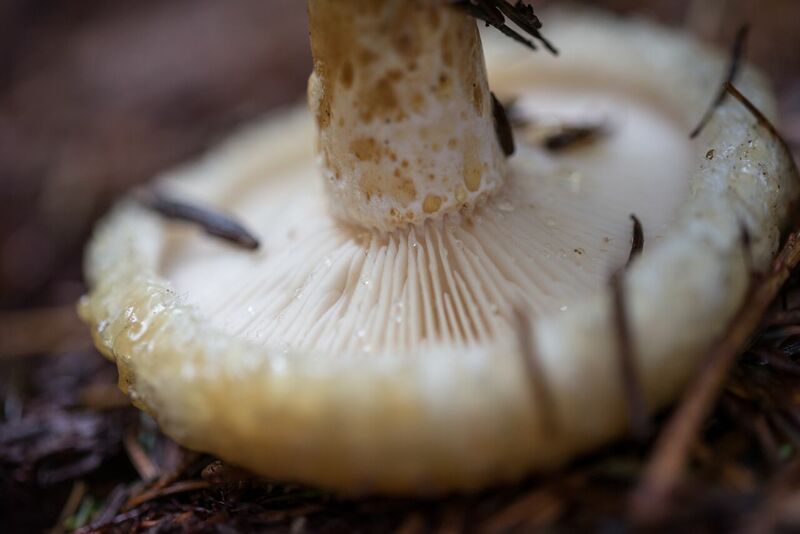 Scattered among the 165 species were almost a dozen mushrooms that residents of Metchosin have been known to collect for the table, including Hedgehogs, Chanterelles, Pines, Laccarias, Shrimp Russulas, and Cauliflowers. At the end of the show, everyone pitched in to restore the room to its original condition. Experts drifted over to Andy and Mairi MacKinnon's house for a final supper together. 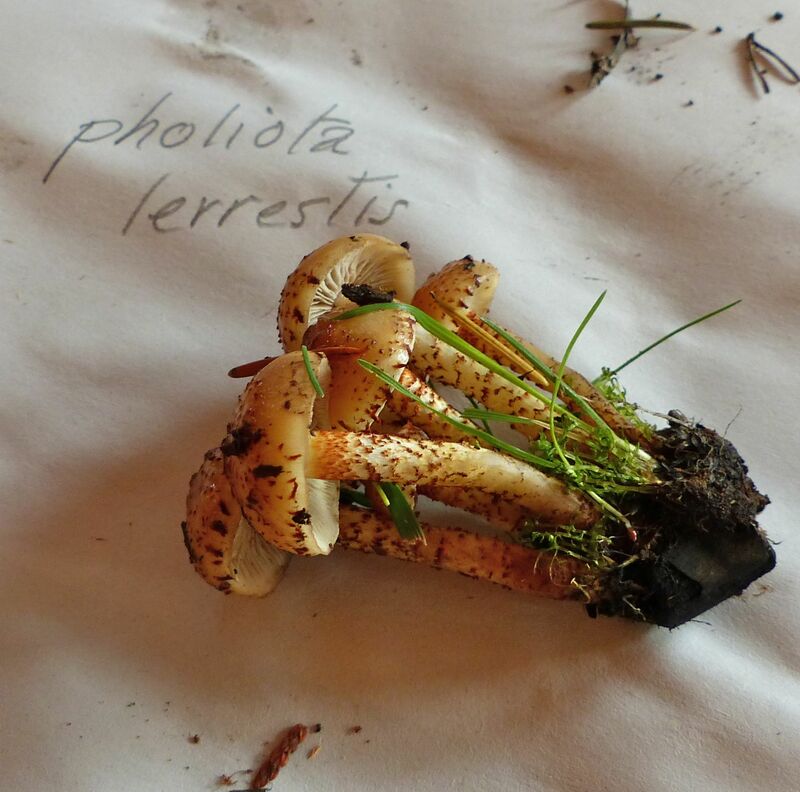 Thanks to these experts, the BioBlitz/MycoBlitz database now contains, among its 2180 species, more fungi than any other category of organisms. 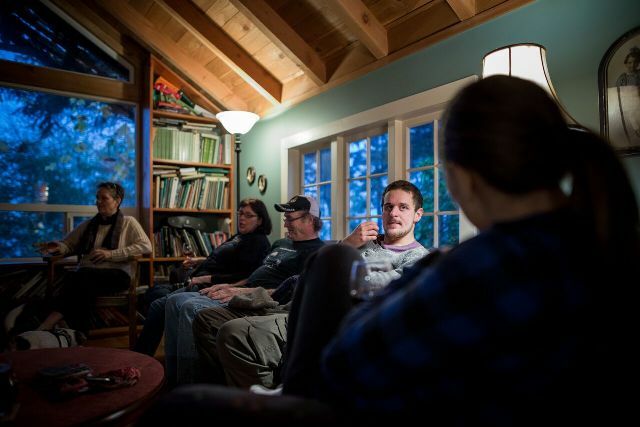 The experts gather at Andy and Mairi's house to watch the sun go down on a busy day of mushrooms. Left to right is Mairi MacKinnon, Leanne Gallon, Kevin Trim, and Ben Hircock. Photo by Luke Mikler. 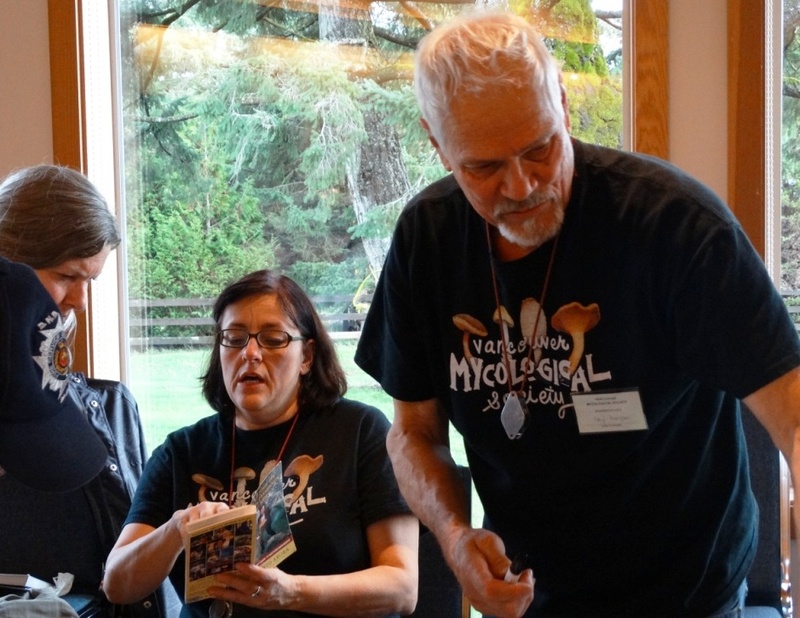 The Metchosin Biodiversity Project, organizer of the third Metchosin MycoBlitz, would like to thank its sponsors and helpers. 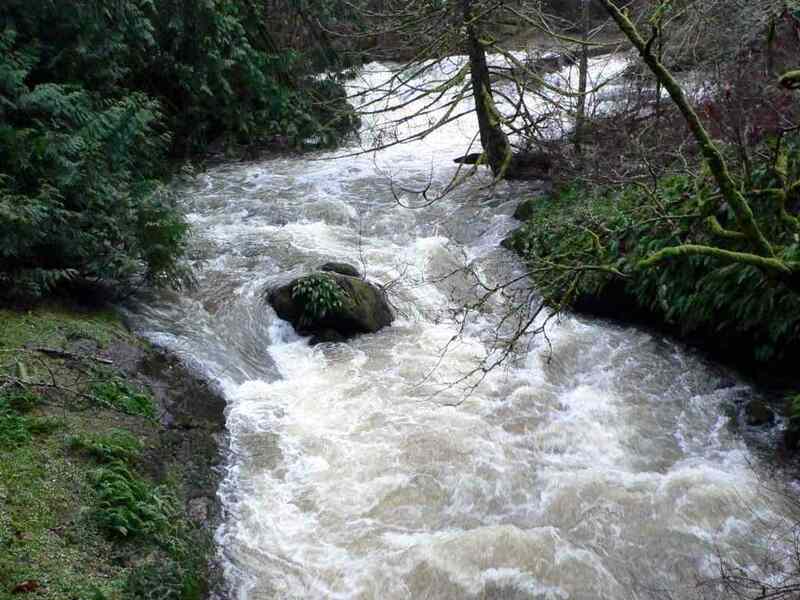 These include the Metchosin Foundation, CRD Parks, the District of Metchosin, Royal Bay Bakery and COBS Bread. 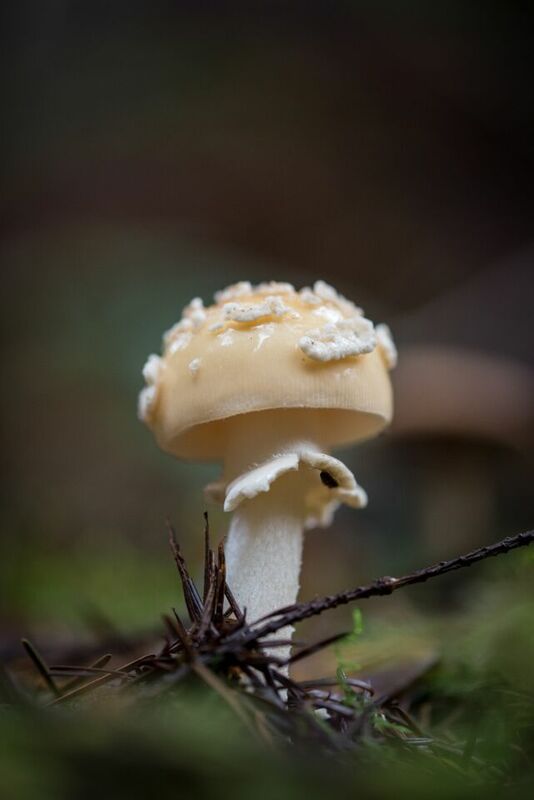 Amanita gemmata, the Jonquil Amanita. 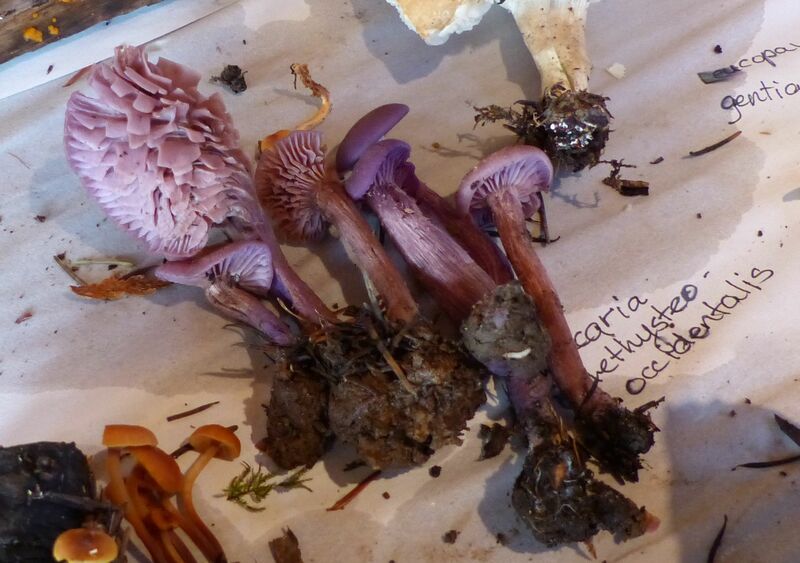 Laccaria amethysteo-occidentalis, the Amythyst Laccaria. 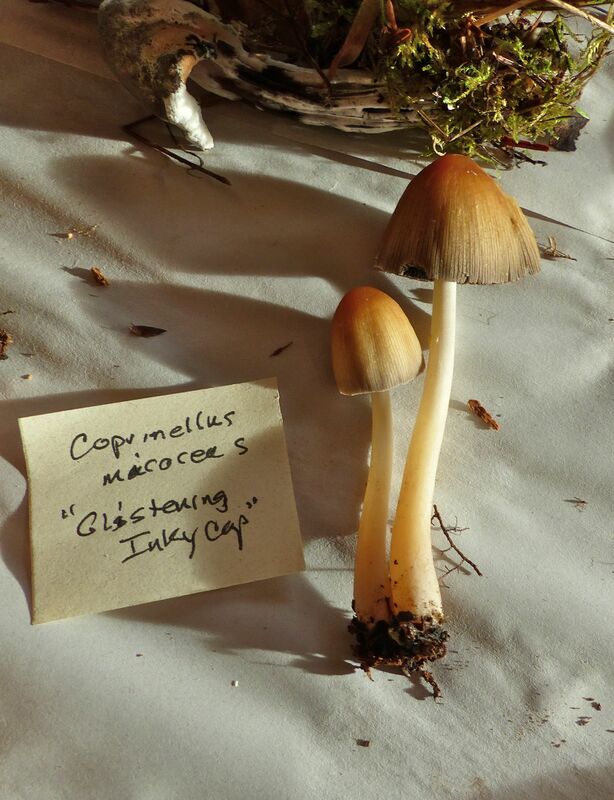 Coprinellus micaceus, Glistening Inky Cap. 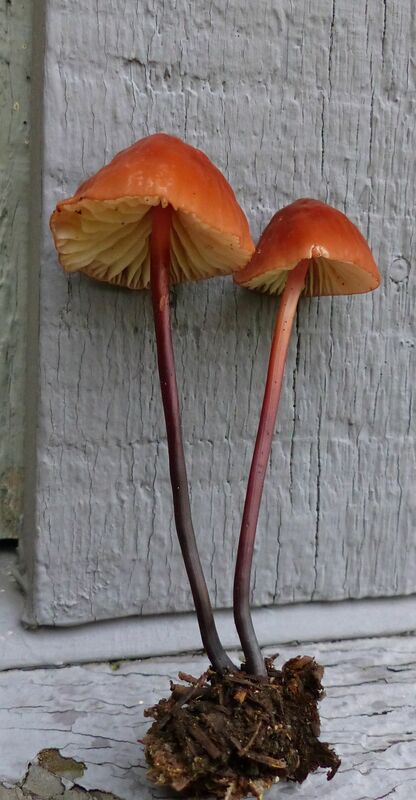 Lactarius pallescens, Pale-capped Milk Cap. Phlebia radiata, Looks like someone upchucked! 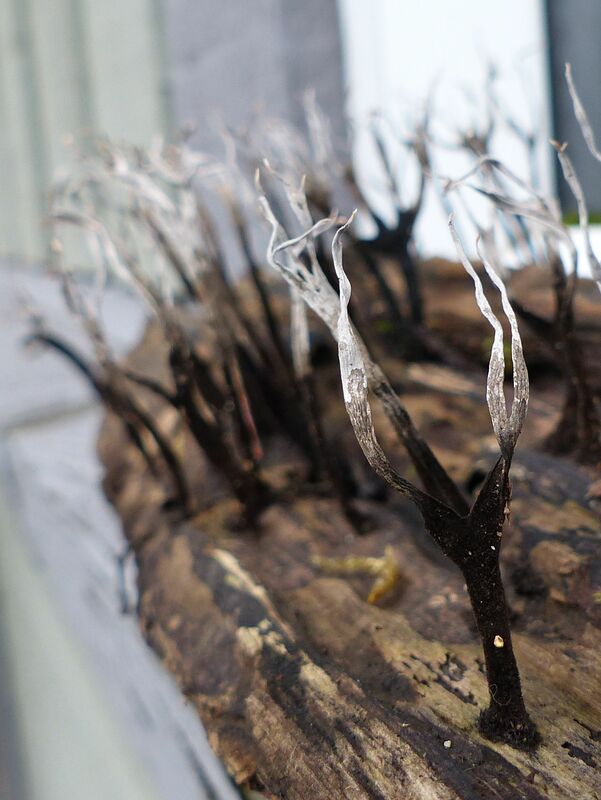 Spore-producing bodies of a slime mold. Urnula padeniana, Starving Man's Licorice. Pseudohydnellum gelatinosum, Toothed Jelly Fungus. Andy MacKinnon calls this mushroom Spirit Gummy Bear! The world's tallest Fly Agaric, Daryl Thompson. 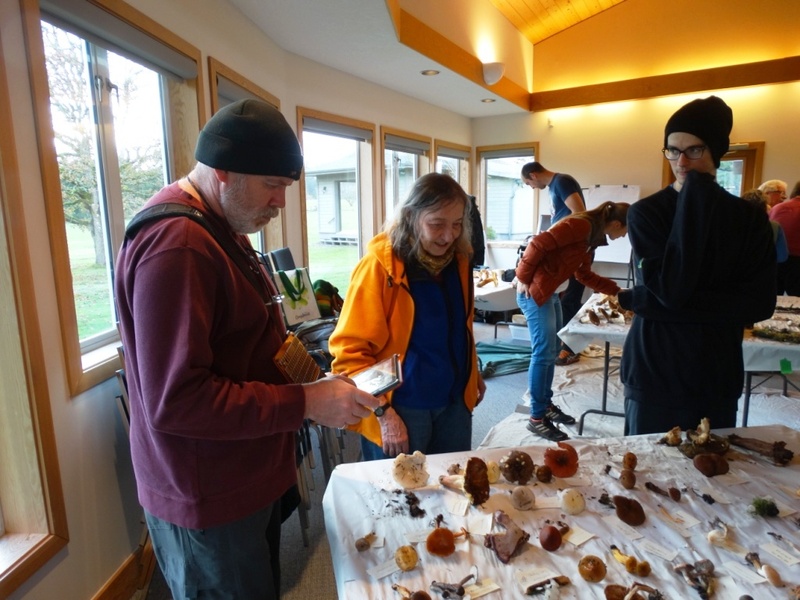 And now for some event and people photos of the 2015 Metchosin MycoBlitz (click on the pictures to see enlarged versions). Adolf Ceska and Ian Gibson pool their perspectives. Adolf Ceska eats some soup and examines the mushrooms. Or was that eating the mushrooms and examining the soup? 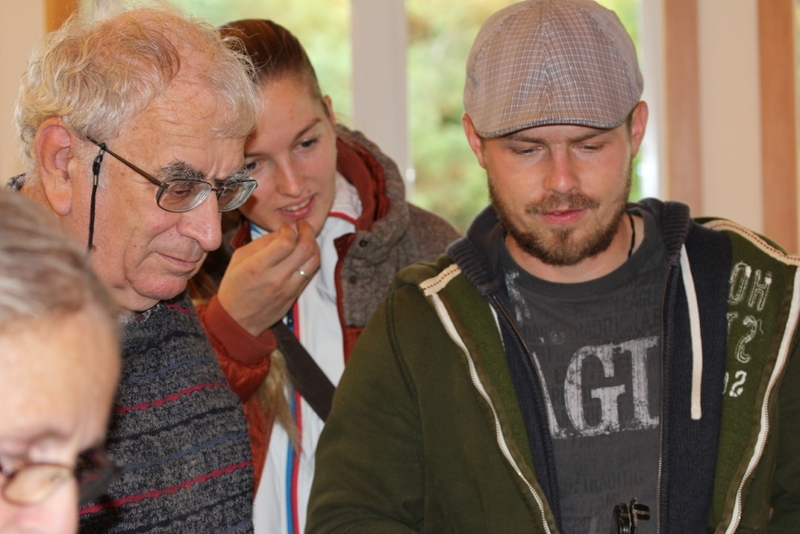 Andy MacKinnon shows Clare Lowery and Steve Gray some of the collected specimens. Daryl Thompson and Leanne Gallon work the Blinkhorn table during the show. 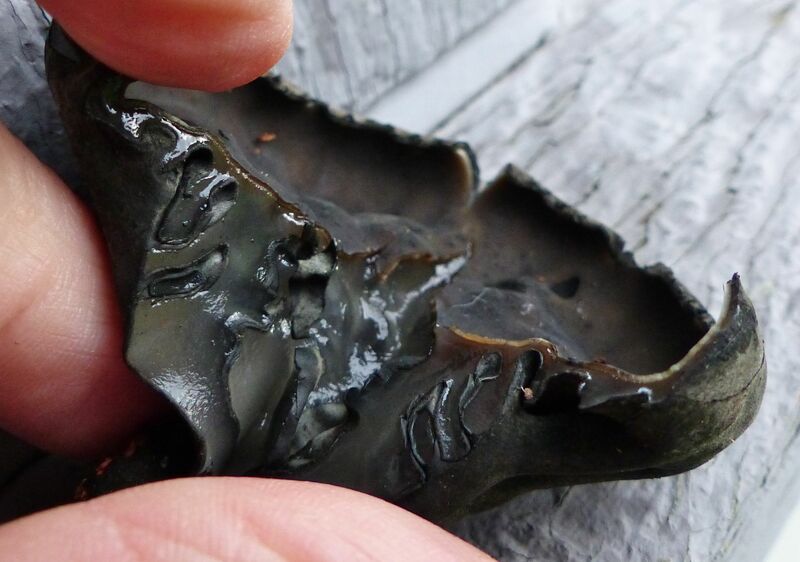 One of the searchers at Metchosin Wilderness Park finds her first-ever Lobster mushroom. 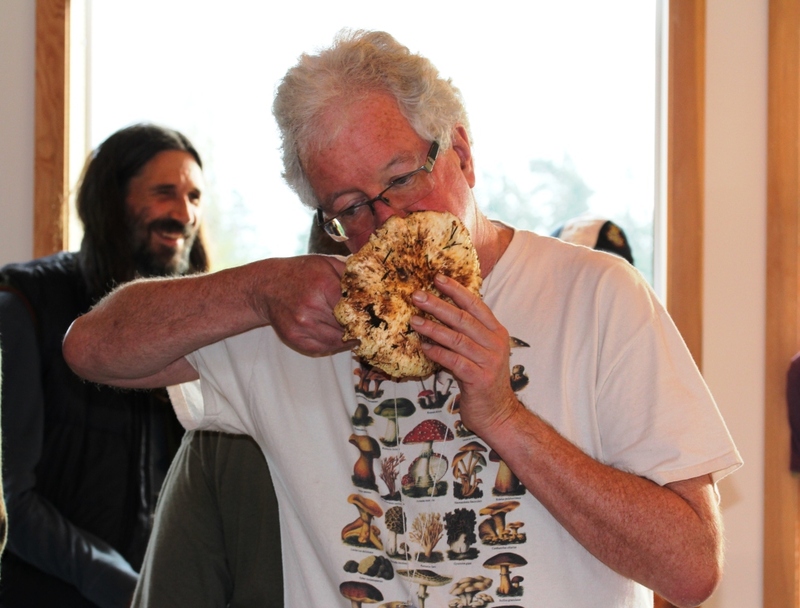 Andy MacKinnon gives a Pine Mushroom the definitve test. Is the the smell of cinnamon or gym socks, Andy? Kem Luther prepares to lead the mushroom lambs into a forest of hungry wolves. 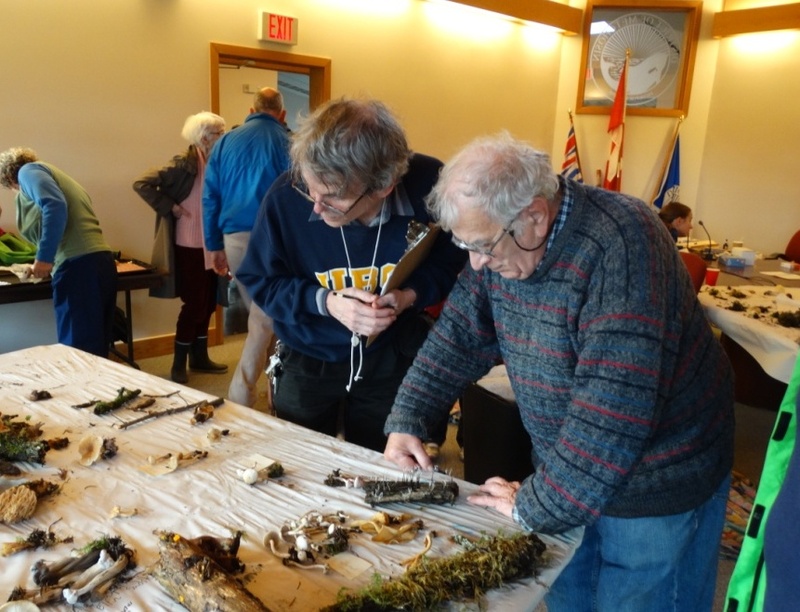 Adolf Ceska imparts bits of wisdom to the guests at the Metchosin MycoBlitz afternoon display. Time to wake up and smell the Stereum hirsutum. Or is she using it as a fake moustache? 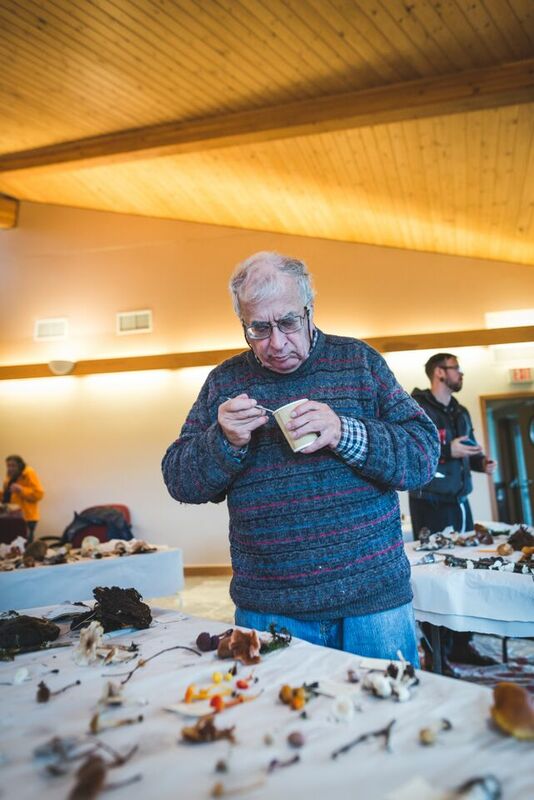 Tony Trofymow collected specimens from the tables for DNA analysis, as he did last year. Kem Luther and Rich Mably try to key out a mushroom. 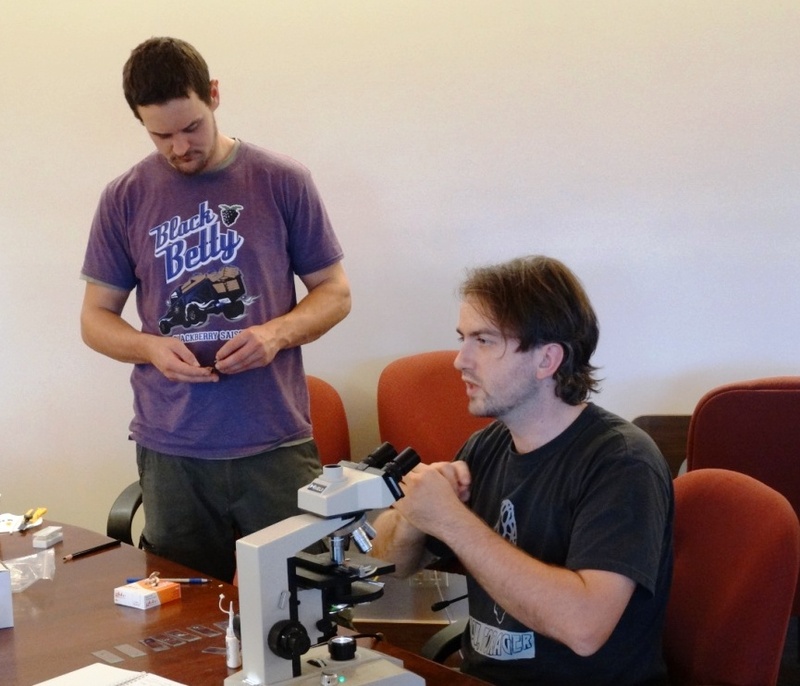 Ben Hircock (left) and Tom Witte use a microscope to look more closely at spores and such. 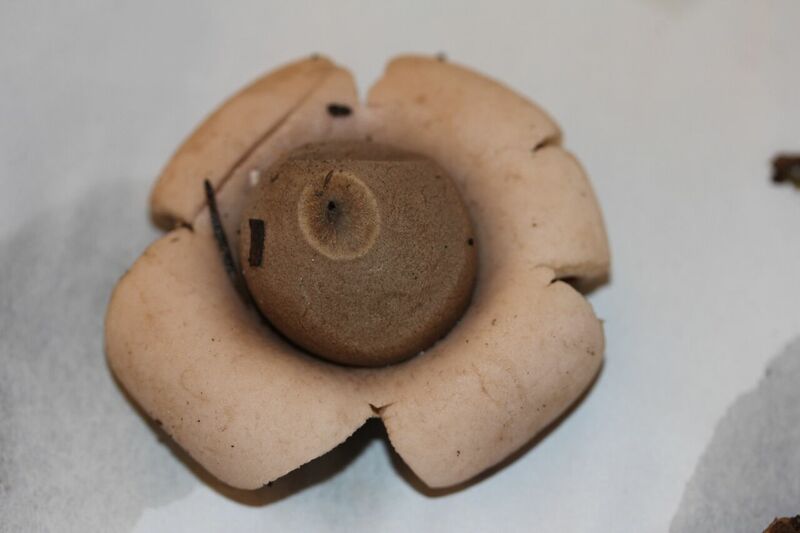 Ian Gibson and Leanne Gallon show some beginners what to look for in the mushrooms. 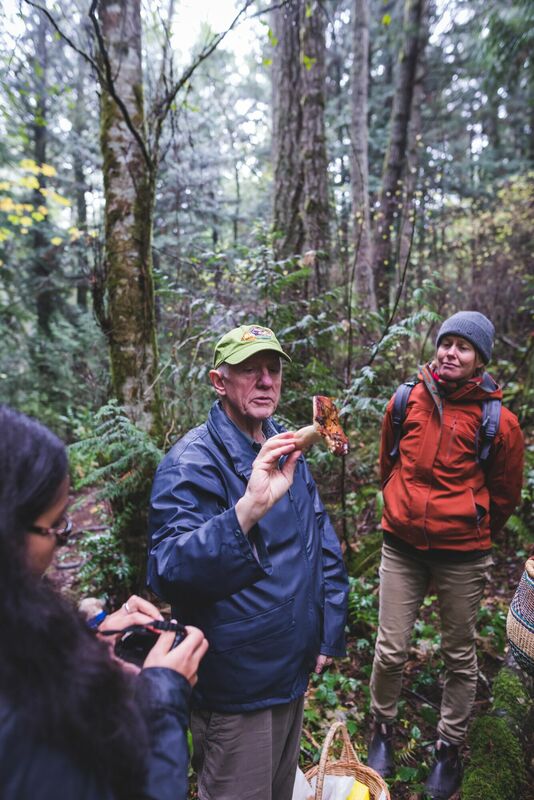 Kem identifies an unidentifiable Russula for guests at the Metchosin Wilderness Park. Oluna checks to see if there are mushrooms she should take home to work on. Adolf Ceska chats while Tony Trofymow and Ian Gibson work. How typical is that?